Fill the cupcakes: Using a sharp knife, cut a circle/hole into the center of the cupcake to create a little pocket about 1/2 inch deep. Place 1 teaspoon of strawberry filling inside and top with the piece of cupcake you removed to seal. See photos above. Repeat with all 12 cupcakes. You will have leftover filling to use in the whipped cream.... Fill the cupcakes: Using a sharp knife, cut a circle/hole into the center of the cupcake to create a little pocket about 1/2 inch deep. 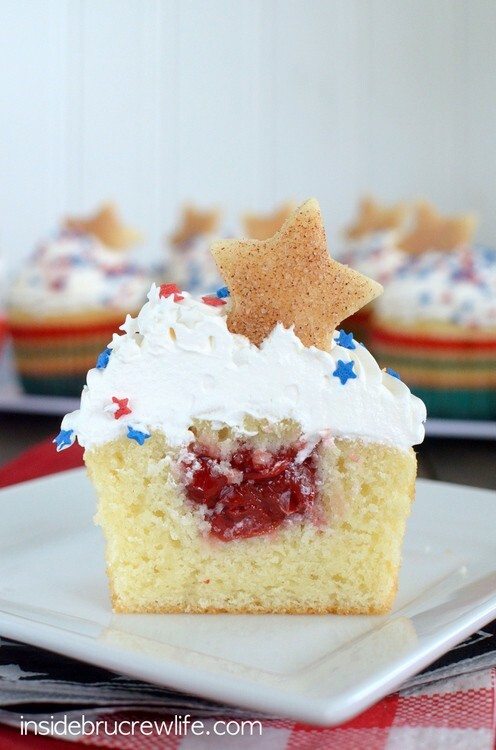 Place 1 teaspoon of strawberry filling inside and top with the piece of cupcake you removed to seal. See photos above. Repeat with all 12 cupcakes. You will have leftover filling to use in the whipped cream.